Da Bears Blog | Which Wide Receivers in the 2019 Draft Fit the Testing Profile for Matt Nagy’s Offense? This is a really athletic group of WRs. 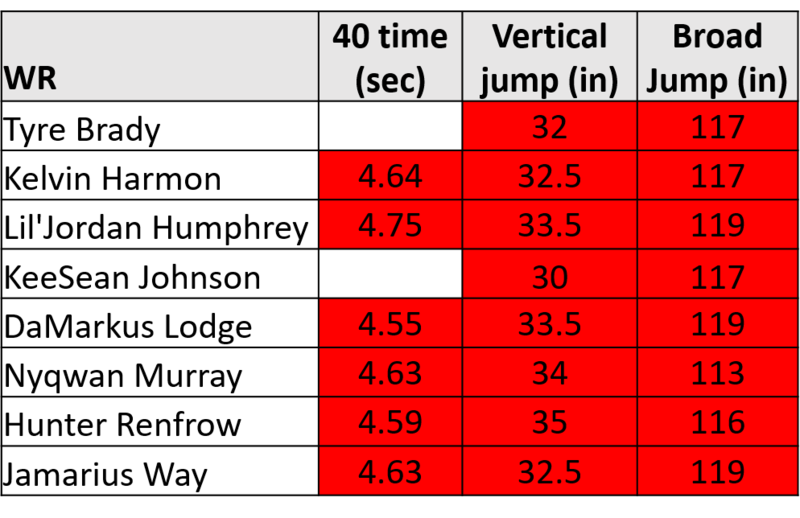 Only 7 hit all three thresholds at the Combine last year. Many of these players are projected to go before the Bears have their first pick, and certainly before the Bears would likely start to consider drafting another WR in round 5 or so. But a few might be late round possibilities, and these are ones who might be interesting fits for the Bears. I’m particularly interested in players who could potentially replace Taylor Gabriel after 2019, when he might be a needed cap casualty. To that end, projected late round picks with blazing speed like Andy Isabella, Darius Slayton, Johnny Dixon, and Miles Boykin could be interesting for the Bears. There were six WRs who hit two of the three thresholds at the Combine. 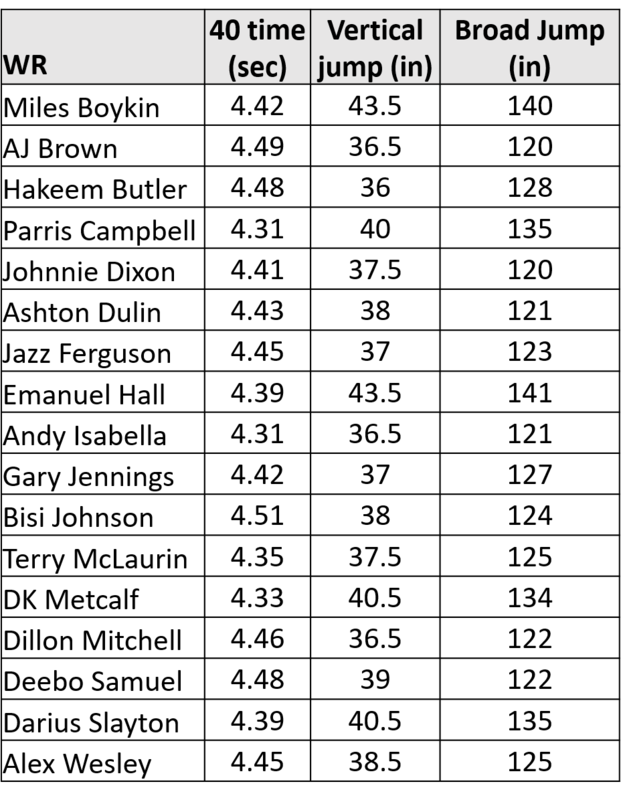 They are shown below, with the threshold they missed highlighted in red. Pretty much all of the Chiefs players, plus the three main Bears WR acquisitions in 2018, hit at least two of the three thresholds, so any WRs the Bears target in the draft are likely to fall in one of these first two groups. Not all misses are the same. 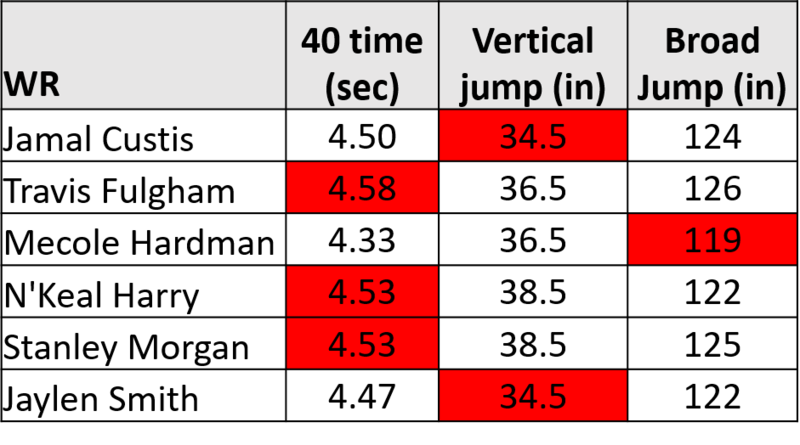 Jumping 34.5″ isn’t that far off from the 35.5″ threshold, nor is 119″ that far from 120″. A 4.58, on the other hand, is appreciably slower than a 4.51. I had to set a threshold somewhere, so I set it as the historical Combine average at the position. Late round guys from this list include Jamal Custis and Jaylen Smith. Mecole Hardman fits the small and speedy profile if he drops a bit into day three. There were 11 WRs who hit 1 of the 3 thresholds at the Combine. They are shown below, with the thresholds they missed highlighted in red. Several players on this list missed one of the drills, which is an automatic miss that might change on their pro day. 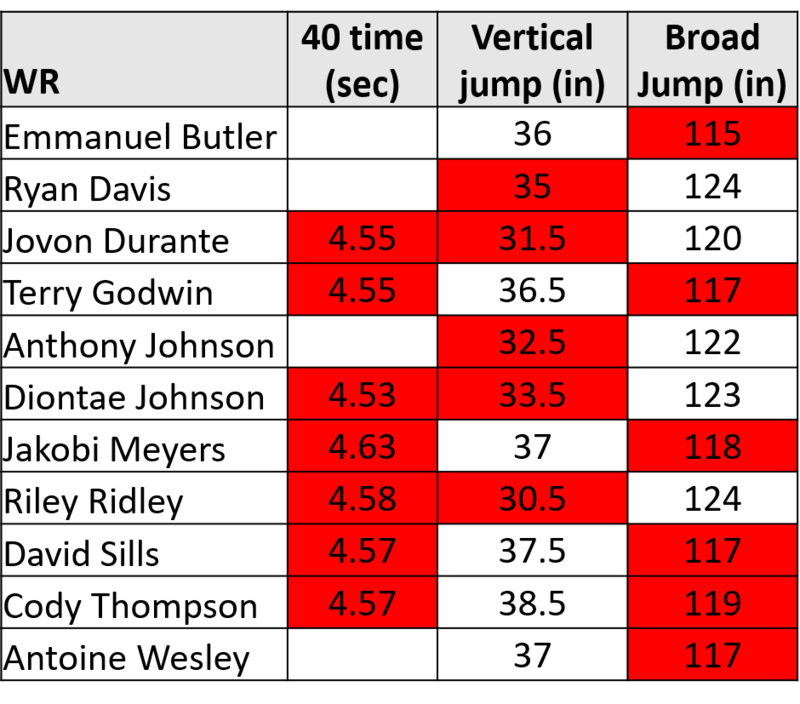 It’s worth noting Anthony Miller didn’t work out at the Combine at all last year, but then hit all three thresholds at his pro day. It’s also worth noting that Javon Wims was 0/3 at the Combine, so the Bears might not be factoring in athleticism as much in late flyers as they would in premium investments. Eight WRs hit none of the three thresholds at the Combine. They are shown below, with the thresholds they missed highlighted in red. Again, it’s worth noting that Javon Wims was on this list last year, and the Bears still grabbed him in round 7. Maybe it doesn’t matter as much with late round guys. Six players didn’t run any tests at the Combine, but will presumably work out at their pro days. These could be worth keeping an eye on, as Anthony Miller found himself in this situation last year. What late round WR would you love to see the Bears target?